The third book in the series by Brad Laird. 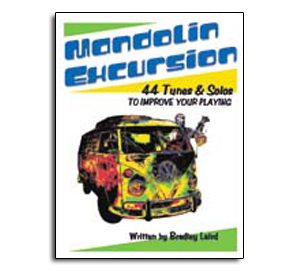 This book presents a wide variety of mandolin tunes and solos, 44 to be exact, which will broaden your repertoire and increase your skill level. The tunes run the gamut from breaks to bluegrass standards, classic jam session tunes, offbeat original tunes, Celtic tunes, and old-time fiddle numbers. The arrangements range from downright easy to challenging, but all of them are playable with some practice by average musicians. Unlike some of the mandolin tune books (transcriptions of star mandolinists), you don't have to be a child prodigy or master of the mandolin to learn these tunes! This is a learn by doing method. In some cases I have presented multiple versions of the same tune, each one progressively more challenging. If you play the tunes, and learn them well, you simply cannot help but become a better mandolin player! The checkout process allows you the option to use your Credit Card or your PayPal balance.